Our Iced Cream Sundae floral arrangent is a truly scrumptious mix of bautiful lilies, stunning carnations, the best quality roses and chrysanthemum blooms all hand tied with eucalyptus and palm leaves. The arrangment is presented to the recipient in a water bubble and flower bag with ribbons to complement ready for them to display. At Blooms we take pride in our floral arrangements and delivery options. We only use the freshest flowers and whether the product is ordered over the website or on the phone , your chosen arrangement can be delivered same day by Blooms if ordered before 2pm. Flowers make an ideal gift for that special someone or a friend , a relation , your partner or spouse and they can simple suit any occasions and every taste. All our flowers include an appropriate gift card ready for the receiver to read. We deliver to most Sheffield post codes , North Derbshire and North Nottinghamshire - All included in the price! So what are you waiting for? 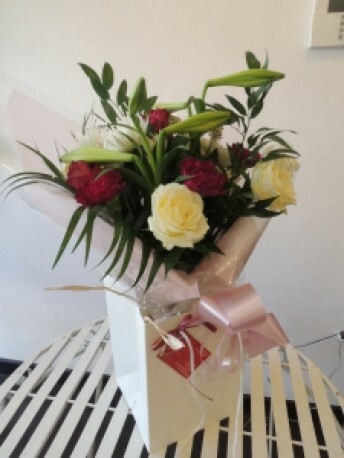 Let Blooms take care of your order and make someones day today! We are open from 9.30am until 4.00pm Mon-Tues , 9.30am until 5.00pm Wed-Fri and 9.30m-3.00pm on Saturday. If you would like to discuss your order on a more personal basis over the phone please dont hesitate to contact us on 0114 2359909.